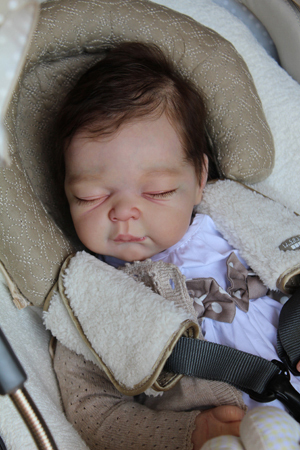 Special Edition reborn doll kit, only 100 available!! Adrie personally signs and numbers the "Front opening body" (or torso body) that comes with the Special edition of Nancy. With this body, Nancy will measure about 21-22" / 50-55cm with limbs alone. Nancy is also available with torso, torso set includes limbs and cloth upper body. With the torso her size is 22-23"
The german made vinyl (same as Paris and Mix & Match Collection) is very lifelike and soft, so easy to root and of course phthalate free as all our kits are. Her 3/4 arms and 7/8 legs are made exclusively for her and the torso and will not be used on future kits. So Nancy is, and will stay a unique doll kit. Head Circumference: 15.3" / 39 cm. Vinyl half torso with jointed cloth upper body. #147 Anatomically correct Girl Torso 21-22"